‘Norwich City’s long run without victory continues. Queen’s Park Rangers extended it to 23 matches at Carrow Road this afternoon when a crowd of 11,722 saw them complete the double over the Canaries. The first half, in which Rangers took the lead after 20 minutes, saw the visitors in almost complete control, and although City improved afterwards, they lacked the finesse to unsettle Rangers’ steady defence. Hunt, netting his 15th goal of the season, roused City’s hopes with an equaliser six minutes after the interval, but a blunder by Pointer presented Rangers with a winning goal five minutes from the end. Ashman won the toss and set Rangers to attack the river end and face the strong sun. 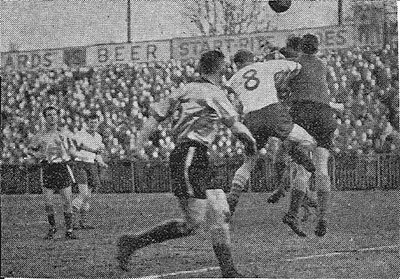 It was the Canaries who first attacked, however, through Hunt and Kitchener, but when Ashman put the ball through to Laskey the inside-forward’s first kick in League football was a slice which put the ball behind. Rangers immediately attacked strongly on their right and there were incredible escapes for City as three visiting forwards completely missed their kicks in front of an open goal. A free kick to Rangers brought another escape for City, however, Ashman and Nethercott between them lost the ball when Andrews centred and Peacock shot over from only a few yards. City’s own attack had not yet got moving at all smoothly, but Springett was in action taking an Ashman free kick for a foul on Hunt. Another corner to the visitors was charged down by Billington at the expense of yet another, but in the 20th minute Rangers took the lead as they had threatened for some time. Longbottom fastened on to a cross-field pass from the left and burst through before hitting a right-foot shot that seemed to deceive Nethercott and flashed low into the net just inside an upright. Within a minute Hunt had swung at, but mistimed a left-wing centre from Kitchener, but this was an isolated instance of City aggression. Twice Hunt was trapped by Rangers’ offside tactics, and the visitors came perilously near to increasing their lead after 25 minutes, when Nethercott dived to push round the post a strong shot by Peacock. It was a Billington free kick that brought the Canaries into the picture again, Springett fumbled it and it was put away for a corner. From this Bannister fired in a drive that all but beat the Rangers’ goalkeeper, and City had another flag kick. After 35 minutes Laskey had the chance of a lifetime to mark his debut with a goal. Hunt nodded a right-wing centre into the open space in front of goal. Laskey was there, but when he could have walked the ball in he hesitated, hit a tame shot that Springett was able to palm down and failed to take advantage of the rebound. City’s best work of the half came just before the interval when both Pointer and McCrohan came upfield to initiate attacks. The visitors’ defence, however, was not seriously troubled. Half-time: 0-1. It had been City’ s worst opening half for some time, but they began the second half determined to wipe out its memory. Their first move was a long run by McCrohan, who spoilt it, however, by centring into the side netting. Then six minutes after the interval, easily City’s best move of the match, brought them an equaliser. Ralph Hunt started it in midfield when he flicked a pass to Coxon. The inside-left took the ball on before slipping it inside the back to Kitchener, and the left-winger made the most of his chance. He put across an accurate centre that deceived Springett and dropped straight to Hunt who merely had to nod it into an empty net. Rangers were by no means so happy in defence, and if Hunt had got proper hold of a centre from Bannister, he might well have put his side in front. But there was still danger in the Rangers’ attack. They should have taken the lead again when a low centre flashed across the City goalmouth and Kerrins missed it completely. Rangers had Springett to thank for one spectacular save. He came chasing out of goal to take a long cross from Gavin and did a complete somersault as he landed. In the last ten minutes both sides went flat out for another goal. Nethercott took a long shot from Ingham. Hunt all but bustled Springett into the net when they both went up for a Laskey centre. Five minutes from the end, however, a stupid and unnecessary blunder by Pointer gave Rangers the lead again. Hellawell put over a low ball that may have been intended as a centre, but in any case threatened no danger. Pointer could have stopped it or let it go, but instead he tried a pass back to Nethercott and slid the ball neatly into his own net. Rangers’ more clever attacking play had doubtless earned them some reward from this match, but it was a tragedy that they should have gained it in this manner. Rangers went on to draw 1-1 against Coventry City at Loftus Road the following week.